emphasise their local association as well as draw attention to the contribution they made to their chosen profession. In 2001 the first plaque was fixed in Exeter to commemorate James Green, Devon's first County Surveyor and this was followed the year after by a plaque to Sir Frank Whittle, the inventor of the jet engine, who lived in Chagford. Since then, plaques have been fixed for George Parker Bidder and James Meadows Rendel, both past presidents of the Institution of Civil Engineers who were born in Mortonhampstead and Whiddon Down respectively and in Lyme Regis for Percy Carlyle Gilchrist, co-inventor of a phosphorous removal process that revolutionised the manufacture of steel. 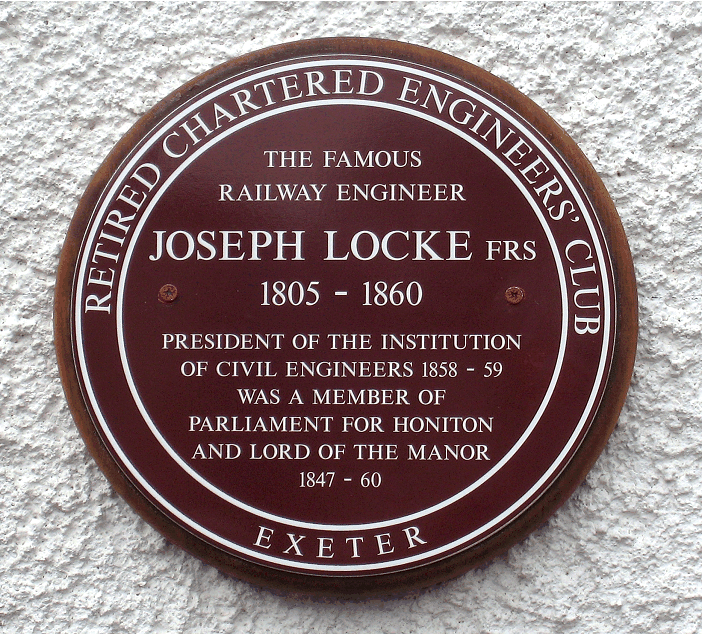 Most recently, in March 2009 a plaque was unveiled in Honiton by Gwilymn Roberts a past President of the ICE, in memory of Joseph Locke the Railway Engineer and MP for Honiton. Research into other potential candidates continues and it is hoped that not only will the project help to revitalise interest in professional engineering but will also serve to highlight the connection such eminent engineers have had with the area embraced by the Club's membership. To view the plaques click plaque above. The origins, projects and activities of the Club are recorded in a short commemorative booklet and a copy of this can be read or downloaded from here. This is the title of a book compiled by members to commemorate the twentieth anniversary of the founding of the Club. Copies of this book have been donated to schools and libraries in the the local area to encourage young people to enter the engineering professions. Those wishing to obtain copies of the book should contact the club using the 'Contact Us' page of this website. "The individuals whose lives are described in the following chapters have one characteristic in common - they achieved their ambitions! "Each one was driven by inspiration and dedication to reach a goal and it matters little that they were known as inventors, mathematicians or ironmongers - they all possessed the 'spirit of engineering that leads to success. The triumphs, frequently accomplished against all the odds, produced outstanding improvements in the quality of life for their own and following generations. "The 19th and 20th centuries saw amazing developments in every field of technology and society continues to benefit from the application of technical expertise. Innovative communication systems, sophisticated medical equipment, new methods of power generation and the latest products from some of the new sciences such as nano-technology are all around us. "At present, the central issues facing our world are concerned with the effects of pollution and the depletion of irreplaceable resources. Through research, scientists, physicists, chemists, geologists and many others will continue their vital contributions to resolve these problems, but engineering is the activity that makes the world habitable. It converts the results of this research into solid, practical, useable products and processes. "This book has been compiled by Chartered Engineers who have spent a lifetime involved in worldwide projects. The achievements of our predecessors have been captured in the fervent hope that these will generate the enthusiasm of the 'spirit of engineering' in today's youth - the engineering pioneers of the future."